ABOUT UNCIRCULATED AU-50 to AU-59 fast stempelglanz or "VZ-ST"
CHOICE UNCIRCULATED MS-63 Stempelglanz or "ST"
GEM UNCIRCULATED MS-65 to MS-66 Erstabschlag or "EA"
Proof coins are produced through a special process involving specially selected, highly polished planchets and dies. The result is a coin with mirrorlike surfaces. Proof state quarter. Note the mirrorlike surface of this coin! A Mint Mark is a letter or a marking that shows us in which city the coin was struck. 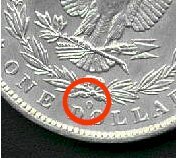 Over Mint Mark D/S D/S means that a new mintmark (D) was engraved over an old (S) on the planchet. This over mint mark is also called D over S. The D looks a little bit damaged.